England hope to appoint a head coach within the next month, according to England and Wales Cricket Board chief executive David Collier. Interviews will take place this month for a successor to Andy Flower, who resigned in January after the 5-0 Ashes loss in Australia. "We will be interviewing this month and hopefully have an appointment before the start of the season," said Collier. England's next match is a one-day contest against Scotland on 9 May. 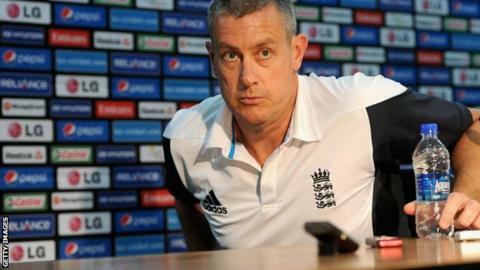 Current England limited-overs coach Ashley Giles, former England coach Peter Moores - currently in charge of Lancashire - Nottinghamshire director of cricket Mick Newell and New South Wales coach Trevor Bayliss are reported to be among the contenders. "[ECB managing director] Paul Downton and the people we've used to help recruit the coach have searched the world," Collier told Test Match Special. "It's a fact there are a limited number of coaches around the world at this present time. "You've only got to look at the media speculation of who might or might not be on lists to see that there are not too many names on that. Spinner Graeme Swann retired during the Ashes and batsman Kevin Pietersen was sacked after the tour, and Collier says the rebuilding process offers plenty of competition among players. He added: "I can't remember in my time the opening month of the county season being so critical. "There are a lot of players with a lot to prove and a lot of places up for grabs. "Somebody has the opportunity to earn their place in the England side and that is very good thing for county cricket."